There’s no doubt about it, Green Is Good. We’re talking about your grassy green lawns of course! Arizona has a diverse and beautiful natural landscape with a dazzling array of flora and fauna. Summertime can be harsh here, especially on our lawns! At Blue Marble Landscape we believe that keeping your lawn in tiptop shape starts with knowing how to care for it through all of the seasons. Our proper lawn maintenance will keep your grass growing and looking its best all year round. Effective lawn care in the fall leads to lush green grass in the spring! In fact, fall is a great time to proactively tend to your turf! As most commercial landscaping andlawn experts would agree the next few months provide an excellent time to fertilize your lawn, aerate the soil and take care of energy absorbing weeds.Grass and sod fertility, irrigation, seeding and consistent mowing are necessary for a thick dense lawn. That marvelous aroma of freshly mown grass is one of the simple pleasures in life; fortunately, doing it often enough will keep your grass green and healthy. Want to produce a lawn with that bright-green color and a well-manicured look? Blue Marble clients often ask how we keep their properties and lawns so beautiful. It’s more than just applying the right fertilizer. Water and turf management means taking a creative and dynamic approach to the grounds that we manage and it shows in the expert results that we achieve for our clients. There are quite a few ways in which we keep your lawns and grasses looking healthy. Water plays an important role. Aside from being an essential source for keeping all living things alive it also helps to keep our lawns green. We create the best conditions for Arizona sod by watering it properly. Water management at Blue Marble tracks water usage and makes adjustments when necessary. We specialize in irrigation system re-design, and drainage issue resolution. Proper aeration, weed control and soil assessment are also part of how Blue Marble keeps lawns looking green and healthy. Aeration will help to loosen that hard Arizona soil. Soil testing will let us know the pH of your soil, to see if it’s in need of acidic or neutral treatment. Weed management requires expertise and constant attention from our trained applicators. The first defense against weeds in your sod grass is a healthy lawn, so the Blue Marblelandscape management team always focuses on proper weed management to keep your grass healthy. Mowing: Proper and consistent mowing is essential for a healthy green lawn. Grass should never be mowed too short (which is called “scalping”) but it shouldn’t grow too long either. Shorter grass actually uses more water. Cutting the grass just right will allow more sunlight to reach the crown of the grass, and then there is less leaf to turn brown during the winter. At Blue marble we use only the best and highest rated equipment, making sure our blades are sharp, as dull blades injure a lawn by tearing rather than slicing blades of grass which pulls out new growth. Aerate The Soil: This means exactly what it sounds like; a machine will expertly punch holes into the soil and extract plugs of dirt. This is an ideal time of year to aerate your lawnso that oxygen, water, and fertilizer can easily reach the roots of your grass. Aeration also prevents soil from compacting. During aeration organic materials can be added to soil, which will add essential nutrients to help grass grow. It even helps the soil retain water! Rake the Leaves: Yes, Arizona actually has deciduous trees. Regardless of whether you use a rake or a lawnmower, it’s important to remove leaves before they turn into a soggy, suffocating mess. Fertilize: Grass leaves grow much slower as the weather turns cool, but the grass roots and rhizomes continue to grow quickly. Fertilizing adds nitrogen to the soil that will help promote growth. With the correct fall application of fertilizer Blue Marble delivers essential nutrients for the grass to grow deep roots, keeping nutrients on reserve for a healthy start next spring. 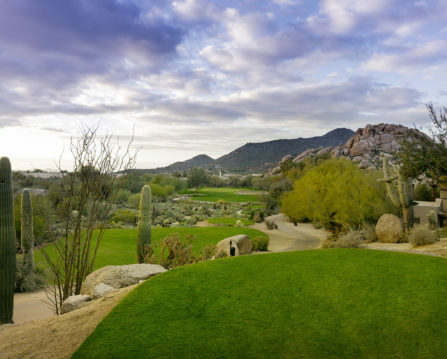 Overseeding: October is approaching quickly and as all the golfers here in Arizona know, it’s that time when lawns are overseeded.The optimum time to overseed your sod grass lawn in Arizona is when the evening temperatures consistently stay below 65 degrees. Overseeding grass keeps the grounds fresh and green through the winter months. If a green lawn is essential for your commercial landscaping needs, get ready for some overseeding! Weed Control: If broadleaf weeds like dandelions have taken over your lawn, now is the perfect time of year to take control. Weeds, like most plants, are in energy-absorbing mode during the fall. They drink in everything that comes their way, including weed killers. Expertly applying an herbicide now means the weeds likely won’t return in the spring. Remember, weeds are opportunistic, waiting idly until given a little room and a little sunlight to allow them to start growing. With Blue Marble Landscape you’ll have a properly maintained thick dense sod that will keep weeds from ever getting started in your lawn. Blue Marble Landscape For All Your Commercial Landscaping Needs! Are you ready to be the envy of other commercial properties in Arizona thanks to your beautiful green lawns? Blue Marble Landscape has everything you need to enhance or maintain your lawnsand we understand that the overall beauty and well being of your community is reflected in turf management. The best landscaping is not just about maintaining, sometimes it also requires improving your landscape. Blue Marble can improve the curb appeal of your property within specific budget parameters. As one of the most popular commercial landscaping experts in Arizona we have raised the bar pretty high! That’s why we are providing so much more than exceptional grass, turf and lawn care. At Blue Marble we think of our clients as partners. As in any committed partnership we promise to do what we say we will do. A strong work ethic that honors commitment can be hard to find in the field of commercial landscaping. A partnership with Blue Marble Landscape means we will provide a full range of landscaping services with solutions that will meet all of your needs and expectations, all within your budget. Come experience the Blue Marble difference. For more information, please call 480.895.2684 or click here. While most people enjoy the break from the heat when the cooler weather arrives in Phoenix, chances are your plants and trees don’t feel the same way. Request a bid now and let your landscaping speak for itself!